Now you might be wondering how come I’ve been out and about and trying so many new food places recently? Well I’ve been lucky, I’ve been invited to go on a food tasting tour in Sheung Wan. 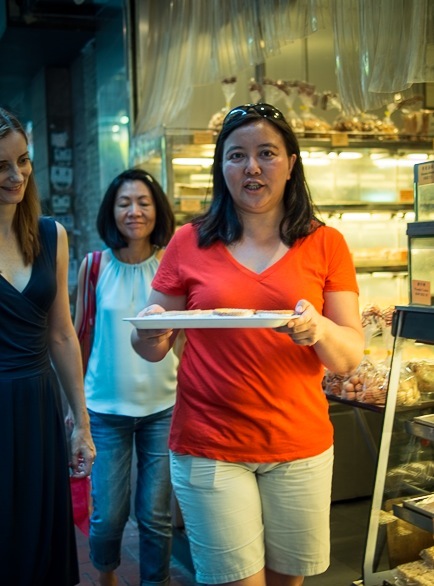 Cecilia and Silvana from the Hong Kong Foodie Tours took us out on a tour that lasts almost 4 hours and visits six places of great Cantonese cuisine in restaurants and shops that have been owned and run by the same family for many years. They lead us through Sheung Wan and talked about its history, culture, architecture and of course, classic food dishes. We tried different snacks and drinks, sat down and chatted about how it is to live in Hong Kong and not knowing that some of those great places existed – all three of us, Patrick, Monica and I had no clue. We were lucky that we had our two very insightful guides and we enjoyed a fun afternoon. Here is Cecilia with a tray of freshly baked egg tarts from Hei Lee Cake Shop in Sheung Wan. 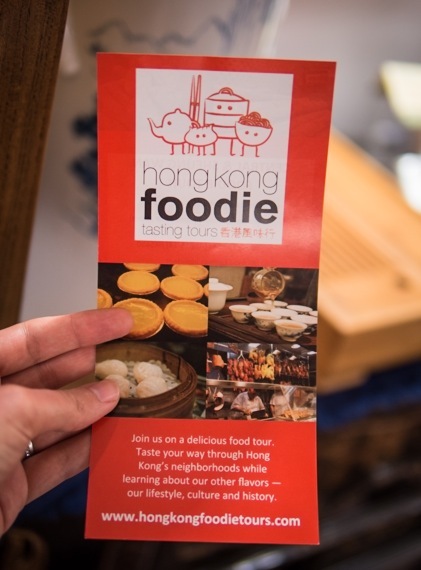 If you’d like to find out more about the Foodie Tour company and its tours in Sheung Wan as well as in Sham Shui Po, check out their website. It’s great for visitors and people living in Hong Kong alike. Disclaimer: I’ve been invited to join their tour for free – and because I liked it so much, I decided to blog about it. Hope you’ll enjoy it too. I recently tried it and really enjoyed the Foodie tour. Discovered so many new places!